Much has been written concerning the ‘armor of God’ and spiritual warfare. Some say that there is no such thing as spiritual warfare and some, going to the other extreme, see every difficulty of life as a direct attack from Satan. In a series of seven articles, I would like us to look at the ‘armor of God’ we read about in the sixth chapter of Ephesians. I will not focus as much on the ancient usage of actual armor as I will focus on the meaning and application of the passage. I will only speak of the actual physical armor when it helps explain a spiritual truth. It is my intention that, as the Christian reads this series of articles, he or she will be strengthened in their walk with Jesus in practical everyday ways. We are warned in First Peter to, “Be sober-minded; be watchful. Your adversary the devil prowls around like a roaring lion, seeking someone to devour” 1 Peter 5:8 ESV). Peter here reminds us that Satan is real and his goal is to destroy us; he is at war with us. The prize is our soul. In Ephesians 4:27, Paul tells us that we must, “…give no opportunity to the devil” (ESV). Paul’s words indicate that the Devil is looking for ‘opportunities’ to tempt, deceive, and defeat us. Revelation 12:9 tells us that Satan is, “…the deceiver of the whole world” (ESV). The Bible does not clearly say why, but we know that if it were not for the grace of God, Satan would destroy all of us and consign us to an eternity of misery in hell. Every Christian is engaged in a spiritual battle between good and evil. However, our battle is not like earthly battles, we are in a spiritual war, “For we do not wrestle against flesh and blood, but against the rulers, against the authorities, against the cosmic powers over this present darkness, against the spiritual forces of evil in the heavenly places” (Ephesians 6:12 ESV). The Christian’s battle is not so much a physical battle as it is a spiritual battle, or a battle of the mind. It does not matter whether a Christian is a body builder or a child, because the fight is not a physical fight. This battle centers on what we believe about the Truth of God’s Word. Therefore, since the battle takes place on a spiritual level, our armor must be spiritual armor. In ancient times, the soldier relied on his armor for protection; his shield, his sword, his helmet, and other tools were employed to fend off his enemies. When soldiers go into battle, they do things to protect themselves. Today’s military has sophisticated technology that is used to try to keep casualties to a minimum. However, in ancient times, the soldier relied on his armor for protection; his shield, his sword, his helmet, and other tools were employed to fend off his enemies. The Christian needs armor too. “Therefore take up the whole armor of God, that you may be able to withstand in the evil day, and having done all, to stand firm” (Ephesians 6:13 ESV). God does not expect us to defend ourselves apart from His gracious provision. The biblical admonition is to take up the armor that God has provided; He will protect us. “Finally, be strong in the Lord and in the strength of his might. 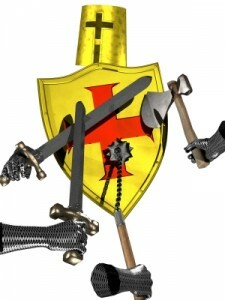 Put on the whole armor of God, that you may be able to stand against the schemes of the devil” (Ephesians 6:10-11 ESV). This verse reminds us that it is God’s power and strength that enables us to resist the devil. The phrase “…be strong in the Lord…” is in the passive voice. This means that the strengthening is being done to us; it is not simply that we muster up the resolve to push on. Rather, we are empowered by something; in this case someone, else. The strength is God’s and the armor is God’s; we, as His subjects, are filled with His strength enabling us to engage in spiritual warfare. Ephesians 1:19 speaks of, “…the immeasurable greatness of his power toward us who believe” (ESV). There are some believers who mistakenly think that, once they are saved, God gives them power and ability to use as they see fit. However, the Bible says that these gifts are controlled by the Holy Spirit, “All these are empowered by one and the same Spirit, who apportions to each one individually as he wills” (1 Corinthians 12:11 ESV). God supplies everything we need to live the Christian life; however, these things only come to us as long as we are faithful to love, honor, and worship Him…as He rightly deserves. We have no spiritual power apart from God. The Gospel of John, chapter 15, clearly teaches that our source of strength is our union with Christ. Jesus said, “Abide in me, and I in you. As the branch cannot bear fruit by itself, unless it abides in the vine, neither can you, unless you abide in me. I am the vine; you are the branches. Whoever abides in me and I in him, he it is that bears much fruit, for apart from me you can do nothing” (John 15:4-5 ESV). As long as we have a vital active relationship with Jesus, His strength will empower us to resist the temptation to sin. It matters little whether that temptation comes from Satan or from the culture in which we live. The Bible promises us victory because we are united with Jesus Christ. This brings us to the end of the introduction and the beginning of the passage to be studied in the next six articles. We will be taking an in depth look at the ‘armor of God’. If we take these teachings seriously, we are guaranteed protection against our spiritual enemies; guaranteed because of God’s power and promise. We will be more effective Christian soldiers. If there is no spiritual battle, then there is no God. The Bible, written with the Blood of Christ is the story of the spiritual war that Satan started in Genesis, and his defeat at The Cross. While we still battle every day, the war has been one. Satan’s fight is one a scorched earth retreat in an attempt to take as many of us as he can on his way out. You are exactly right, Satan is a defeated foe awaiting judgment and sentencing. I pray that every believer will take seriously the battle that continues to rage. God bless you. Well done again Robert. Today more than ever we need this armor for protection from the Enemy as he is stepping up his attacks on the Body of Christ. Well done my good friend, brother, and fellow heir in Christ Jesus. You are absolutely right, as usual. It only takes a short time for Satan (or the temptations that surround us every day) to get his hooks in us, if we do not stay focused on God. Thank you, brother, for the kind words. Thank you dear brother in christ for that exposition on our already won victory in Christ. Believers must more than ever be on the alert against the craftiness of satan and his agents who are so desperate now. They are even in churches pretending to serve God but with an agenda to kill like their master the devil. Thank God for JESUS. I pray that this article will help you in your walk with the Lord. God bless you richly. Thank you for your kind words, Vasion. It is a pleasure to have you visit the site and comment. I am very encouraged that the articles have touched you life. I noticed that you wrote that you are not a Christian, but later you wrote that you are a Catholic. I was just wondering why you do not consider yourself a Christian although you are a Catholic (and obviously are involved in ministry). Anyone who has trusted, and continues to trust, Jesus Christ’s payment on the cross for his or her sins, is saved and is therefore a Christian. No matter we call ourselves, the important part is that we love God with all our hearts, souls, minds, bodies, and strength. We do this by trusting in Jesus, and obeying His will for our lives. I pray that you continue to influence many for Jesus Christ. God bless you, brother. Robert,in a nut shell, I have broken every commandment there is to break more than once. How can I be sure I an forgiven and I don’t want to break them anymore.I don’t want to steal, lie, or commit adultery anymore. My wife and family forgave me, but the enemy keeps reminding my wife about the past and get bombarded in her mind. Please help us get through this! We pray,go to church and read the Word. Also pray for healing from diabetes and high blood pressure for my wife and I. Love you brothers! God Bless all you ministry! First of all, let me assure you that you are not alone in your sinfulness. The Bible tells us that, “all have sinned and fall short of the glory of God” (Romans 3:23). Our sinfulness, and our inability to do anything about it, is why Jesus died on the cross. So don’t think you are worse than other people, Jesus died so that your sins can be forgiven. You can know you are forgiven because the Bible says you are, if you put your trust in Him, “For God so loved the world, that he gave his only Son, that whoever believes in him should not perish but have eternal life…Whoever believes in him is not condemned…” (John 3:16-18 ESV). We can also have victory over sins if we are committed to living as He wants us to live. He gives us the strength, but we must be willing to obey. The apostle Paul writes, “But I say, walk by the Spirit, and you will not gratify the desires of the flesh. For the desires of the flesh are against the Spirit, and the desires of the Spirit are against the flesh, for these are opposed to each other, to keep you from doing the things you want to do” (Galatians 5:16-17 ESV). Everyone is tempted, even Christians, the difference is that Christians have the indwelling Spirit to empower them to resist sin. However, we must remember that we still must choose whether or not to obey God or to indulge in sinful behavior. Although we are empowered, we still have to make a decision to do what’s right. If we choose to obey God, He will see that we are successful in resisting temptation (I Corinthians 10:13; James 4:7). The Bible promises forgiveness of sins and victory over temptation; however, we must meet certain conditions (set by God) for those promises to apply. My advice is to find someone you can trust, who is a mature Christian and with whom you feel comfortable sharing your situation. You and your family will definitely be in our prayers. Trust God, study and live by the Bible, and know that God knows you better than you know yourself. Thanks for the wonderful and encouraging messages you post to this site. i am in Zimbabwe and enjoy reading these life changing (transformative) articles. i have been saved in August 2012 and an now following Christ but need to be strengthened in my spiritual walk. i was asked to make a presentation at my church about living a debt free life yet i am over-borrowed. this was after i had been praying specifically for my financial condition for 7 days asking God to help me out of debt. the presentation i made was an eye opener to me about debts in a biblical sense. i want your advice as to how i can seek God’s help to clear my loan bill currently at $10,000.00 without impacting my small business. previously i used to steal to cover such commitments but i really need God’s help. i have fees balances to pay by the 31st of January for my kid and 3 other children i am taking care of as their only guardian yet i am financially crippled. i am currently on a 40 day fasting period with today being the 29th but my conditions are becoming tougher by the day. i am planning to sell my car to settle part of the bill but the car needs a starter to have it run and sell. its a long story. Money issues can be very stressful and sometimes seem insurmountable; however, we serve a great God who is capable of seeing us through any hardship. There really isn’t any way that I can give you advice on financial stuff, except to say “Trust God”. I would suggest you share your situation with members of the Christian community in your area, try to find some Christ centered books on finance management, and remain faithful to God. Matthew 6:25-34 is a very encouraging passage of Scripture that assures us of God’s presence in our lives and of His supplying our every need. God is able and He loves you…trust Him. I will be praying for you. I have read that praise and worship are a part of the armor of God. I have asked a few of my church family with just “perhaps” answers. What part of the armor of God do you think worship is? I believe that worship is the foundation of all of our faith. Worship is what our life should consist of. Loving God with all our heart, soul, mind, body, and strength is what we were created to do. When we are not living this way, we are out of sync with God’s plan for our lives. God bless you. I’m very happy to have joined and receive the emails. I enjoyed the article on Joshua and a connecting article on God’s protection. Thank you for all you do! I just want to say… that I experienced a real spiritual attack while I was falling asleep a few months ago. Something hateful and horrible appeared next to my bed at a friend’s house and pounced on me. It was so full of hate, I felt like it was trying to tear its way into me, but every time it struck me, I felt this ARMOR on my body, like a shield that kept it from getting into my heart. This dark, demonic presence felt like a 200-pound man on top of me, smashing me with its fists, full of rage and hate. But every time it struck me, it pounded against this invisible armor–armor that I didn’t even know I was wearing. I was so afraid my armor would break and this thing would get inside! I started to pray to Jesus and a white light flooded my vision, and the presence immediately retreated. I was awake for the whole experience. I am a very new Christian, just baptized 2 years ago and I rarely attend Church or read the Bible (a huge failure on my part) but I do pray all the time and try to share my faith with others and lead people to Christ in my small, humble way. I wasn’t aware of the armor of God until after this experience, when I called my Christian friend to talk to her about it. So yes, there is the metaphorical armor of God. But there is also a literal armor of God that protects you against dark spiritual influences. I never even realized I had it until I was spiritually attacked. I didn’t even believe I could be spiritually attacked until it happened! Christ watches over and protects His children, you just have to pray and ASK God for His armor! Jesus really does cast out demons and protects us against the devil. I am coming to realize this stuff is a lot more real than I thought. I am definitely still growing in my faith. God bless you! Thanks for reading and commenting. Wow…what you describe must have been terrifying. Nevertheless, God is more powerful than anything that can come against us. I would encourage you to find, and attend, a Bible-believing church and to study God’s Word regularly…after all, He gave it to us so we can know Him better. The armor of God does not function apart from a relationship with Him, it is vitally important to love God with all our heart, soul, mind, body, and strength. Then we can be certain that He will protect us, sustain us, encourage us, and guide us as we serve Him. I am aware that satan tempts a person each and every day. Would that be considered spiritual warfare? Thank you for reading and commenting. I pray these articles are helpful and encouraging in your walk of faith. To answer your question: Yes, I believe that Satan’s attacks (temptations, etc.) could definitely be labeled as spiritual warfare. The Bible says that, “…our struggle is not against flesh and blood, but against the rulers, against the powers, against the world forces of this darkness, against the spiritual forces of wickedness in the heavenly places” (Ephesians 6:12 NASB). There is no doubt that there is a life and death struggle in the unseen world. We also know that Satan “…prowls around like a roaring lion, seeking someone to devour” (I Peter 5:8 NASB). However, the Bible also assures us that God is more powerful than the Devil and that we should, “Submit therefore to God. Resist the devil and he will flee from you” (James 4:7 NASB). We have nothing to fear from Satan or his demons as long as we are living for the Lord Jesus Christ. God bless you, Aileen. This is a well written, EXCELLENT article! I have been tempted personally by SATAN for the past 2 months. There are many different personalities SATAN uses to disguise himself. I now realize what little understanding and little faith I have had. Instead of actually BELIEVING I was tempted by SATAN, I chose to believe the lie he was telling me. SATAN project all kinds of negative thoughts and emotions into my mind, even haunted my dreams while I sleep. I thought I was being stalked and harassed by PEOPLE who hate me. SATAN has told me that I am JESUS at times, and at other times, that I am going to turn into SATAN. At least 1 of the personalities is the HOLY SPIRIT speaking to me, which tells me to read the WORD OF GOD, and SATAN will go away from me. When I read the WORD OF GOD, SATAN does go away for a time. I thank you very much for posting this site. It has helped me tremendously. May GOD BLESS you all. Truly, obedience to the WORD OF GOD is all that we need. If anyone is TEMPTED by SATAN as I have been, PLEASE take my advice and read the WORD OF GOD. If you don’t SATAN will destroy your armor, as he did mine. You will feel a heavy impact against you, as if you are being bombarded by a cannon when the attacks begin. Just remember, DO NOT FEAR! Simply READ the WORD OF GOD! Thank you again for doing GODS work! May GOD BLESS YOU ALL! All these people with stories of being attacked. Press in to the Word and make your calling and election sure. Be sure to speak words of life over your own lives – the Bible says to work out your own salvation. And where possible – please get some anointed oil and bless/cover yourselves, your homes, your neighborhoods, your vehicles. Cover yourself with the Blood of Jesus. I suggest, too, that you let your pastors or church elders know that you are under attack so that they can stand in the gap for you and with you during times of testing. There is no way you can stand against the enemy if you are not confident in, familiar with, or ready to speak God’s Word over your situation. You must grow up in the faith. Satan cannot destroy your armor – your armor is spiritual or God given. He can only destroy your flesh if you refuse to put your armor on. Remember you are a spirit having a temporary human experience not a human having a temporary spiritual experience. If you are saved – you are sealed by God and you have authority, power, and dominion over Satan and his fallen angels. We are in the last days – God is ready to come set this thing off, but He can’t because we are still on spiritual milk. Still needing other people to move us along inch by inch in the faith. But people, it’s time to grow up. Only mature sons inherit the Kingdom. The Bible says an heir (which we are if we are saved), if he is still a child is no different than a slave though, he is lord of all. A child can inherit nothing until he comes of age. Likewise, we cannot inherit and exercise the fullness of God’s promises in Christ until we come of age. Do what you have to do to grow up in your faith. The time is now. God says the harvest is ready/plenty, but there aren’t enough laborers to bring it in. Get your spirit trained up. Go to Bible Study, get in a life group, go to prayer meetings to learn how to pray, watch sermons online and get yourself set free. Speak God’s Word above everything – above your own words, above what you see, above what you experience, above what history, above what you believe if it doesn’t line up with God’s Word.